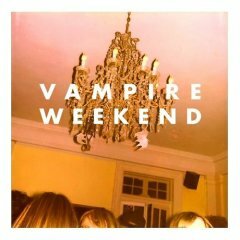 Vampire Weekend | Rantings from a bored mind. Last night I went to see Vampire Weekend at the Wedgewood rooms and they were superb. I think they are great and are along with DLSvsSP are my favourite band at the moment. They started with Mansard Roof and finished with Walcott (funny that, playing a song about an ex-Southampton player in Portsmouth as your encore) via the whole album and more. Oxford Comma was a real highlight though, and for the 45 minutes or so that they were on, all was right with my world. The support band had some good tunes, but the lead singer looked like a chavvy Ian Curtis (of Joy Division) and insisted on singing everything with loads of Echo effect and it was still on even when he spoke. This sounded really terrible. Altogether they weren’t great which is good because I don’t feel too guilty about forgetting their names. Oh yeah, Happy Birthday to me. 1)Its the 29th Febuary. Ive been alive through 6 of these, that makes me nearly a week older than I should be. 2)Finally sorted out my expenses problem, so £500 coming to me. Nice! 3)Ive got tickets to see my new favourite band Vampire Weekend at the wedgewood rooms on the 12th May…the day before my birthday. Excellent present to me I think. 4)The damage to my car isn’t as bad as I thought it was. 6)My blood type is O positive. I finally got the confirmation through. Hmm, looking at it, these things aren’t that exciting. Just shows you how crap my week has been for this to be the top 5 things making me happy. Vampire Weekend by Vampire Weekend. Ever since I first heard Mansard Roof about 5 months ago on Colin Murray’s Radio 1 show I have been waiting for this to come out. It always worries me when the song that I like the most is the first track on the album, but there it is in all of its weird brilliance (Currently on the Heavy Rotation list on All Things Go). Now don’t ask me to name the instruments that are playing most of the time, that has never been my strong point, but track 5 called M79 has a really nice piece of music behind it, and the arrangements throughout are a decent step above the normal dross that is about. I love this album, but then again I like this sort of thing, and I am fairly sure that it won’t be everyones cup of tea, but hey, all you doubters are wrong. Go and listen to Scouting for Girls and their songs about Michaela Strachan, which is a particular annoyance of mine at the moment, but I digresss. Yep, 34 minutes of brilliance on this album, and you don’t often get songs about Architectural features or (possibly) named after 17 year old Arsenal and England strikers.